My mama used to make a tasty dessert that always sounded like “Bolla cheenta”, which is actually the Hungarian palacsinta. They were thin pancakes rolled around sweetened “pot cheese” (small-curd cottage cheese) with cinnamon and were always an extraordinary treat. Years later I prepared palacsinta for a friend and myself and he said they were similar to Blintzes, a crepe recipe popular in Jewish cuisine. We got to talking about filled pancakes and realized they are found all over Eastern Europe with variations almost everywhere else. We agreed that the most celebrated crepe (French for “pancake”) preparation was probably Crepes Suzette. Since I already love palacsinta, I try the Suzette variety. In the ensuing years I make it several times. Apparently I’m not the only crepe lover because all of a sudden there were cumbersome crepe-making machines everywhere and crepes became a fad. Like all fads, the crepe craze cooled off, but not in established upscale restaurants. 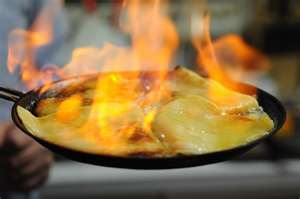 Crepes Suzette with its flambé preparation is always an exciting event for diners and onlookers. A trolley table is pulled up to the table and the dessert is prepared tableside. Making crepes may be off-putting to some but are not difficult to make. It’s important to let the batter rest one or two hours in your icebox. Then the thin batter is poured into a greased pan and swirled to cover the entire pan bottom. Basically, a crepe is just a very thin cooked pancake. The first one may not come out well but the rest will. The Suzette variation has flavourings and orange brandy is poured over the crepes and ignited. Crepes Suzette with the flamboyant flambé technique and the luscious taste of the crepes combine to make a spectacular dessert. If you love desserts and are looking for something out of the ordinary with an entertaining presentation, I urge you to try this regal dish, supposedly invented in 1895 when served to the Prince of Wales, later Edward VII of England. Here is my recipe, adapted from the Fanny Farmer cookbook. · Mix the flour, eggs, milk and salt in an electric blender or with a wire whisk briefly, until smooth. · Add the melted butter and blend to combine. · Put the batter in the icebox for at least one hour. This is important. In a large wide skillet, melt the butter. Just when it is melted, add the sugar and stir to dissolve. Stir in the rind and the juice and bring to a simmer. Adjust flame to very low, or shut off until ready to serve the crepes. Use a 6-inch skillet, lightly oiled using a paper towel, over medium heat. Pour slightly less than ¼ cup of batter into the pan and swirl until fully coated. Cook about a minute, watch the top get dry. Turn and cook about 10 seconds. The batter is thin like cream, if it gets thick thin with a little milk. Make sure skillet is ready for each crepe by wiping with the oily paper towel. Fold each individual crepe in half and put 2 at a time in the warm sauce. With tongs or a spatula, quickly fold crepes in half again. Repeat until all crepes have been added. Work rapidly so all the crepes can absorb the sauce equally. Warm liqueur briefly in a small pan and pour over all the crepes in the skillet. Do not pour directly from the bottle. With a wooden match or a long match, ignite the liquer. Remove the skillet from the heat. The flame will burn for about a minute. When it’s all burnt and the alcohol is evaporated, put the crepes on dessert plates. Dust gently with the confectioners sugar (you could pour some through a strainer) and garnish with the orange slices. If you prefer, you can certainly omit the alcohol flambe and the dessert will still be excellent. You could add a dash of orange extract to the sauce. Either way, try some Crepes Suzette, a grand old classic. Yay! A french dish! I'm going to give this one a go! I'm sure the kids (and my hubs) would love it! The festivity is grand, especially when you turn the lights off for it. SAMANTHA: You will all (Y'all will) love it. I hear crepes are popular for La Chandeleur Feb 2nd. Mmmmm I do love crepes. It took me a long time to figure out how not to make them thick like a pancake. Easy, once you learn. I do like a good crepe. They are hard to make though. And buying them frozen is a waste of money. If I'm at a decent restauarant I'll order them for breakfast. This definitely gets a gold star from me. It looks delicious and I have always been intimidated and scared to try making crepes. This definitely looks tempting. MY JOURNEY: I love crepes too. MALLI: Is'nt it wonderful to see them made, and the aroma is grand. STEPHEN: I love crepes too. LV: Please try to make these. At first, make them without the flambe until you gain expertise. Crepes are very versatile for savoury fillings and such. Delicious photo, I love crepes. Thank you for this delicious recipe. Yum. My grandfather used to take us to a Polish restaurant on the south side of Chicago where they made delicious nalesniki. Your blog entry brings back nice memories for me (even though there is a slight variation). You recipe has me salivating, Anthony! My introduction to crepes came in Paris some years ago. The street vendors offered so many delicious options and I purchased one daily because they were so addicting! LEOVI: Your welcome, We love crepes too. SUSAN: What a lovely remembrance. I never knew my grandfathers. I was in Chicago in the 60's and had latkes there. CAY: Thank You for those kind words, I hope you'll try it. GAIL: I know what you mean; when I prepare them people are very complimentary. I love this photo! ITS AWESOME! PEGASUS: Thank You Peg, it's a great dessert. Crepes look yummy. Resembles our dosas. We normally use the chutney as a dip. We take a piece of dosai and scoop a little bit chutney and have them both together. I am so excited to try this version, sounds delicious!! VARDHINI: Thank You for chutney info. I always use more gingerroot than is called for because I love it so much. MIRIAM: 1 crepe left over could be a song title, but if me I would eat it as soon as determined to be leftover. Don't worry, you'll delight eating it. I am finally cooking again! Yay! I will let you know how it goes. Pancakes have never been my strong dish. I don't know why. But I am determined to really get the hang of it. Oh no, I'd mess up that recipe. I'll leave it to the experts and just enjoy the results. looks tempting and so easy to prepare...mouthwatering! NOEMI: Crepes are not hard to master. Forget about the flaming until you gain facility with the crepe making, then it will be less stressful. You will soon be able to enjoy this wonderful dessert yourself. HEMALATA: Thank you, it is a great dessert. ALEX: If you don't care to make it and can obtain it then perfect. KALYAN: Thank You, it is. Yum! They do sound a lot like the blintzes my grandma used to make. My mom always used the Fanny Farmer cookbook...and now I wonder if this is where she first got her crepe recipe. I LOVE crepes...and have never made crepes Suzette. You've inspired me!!! MISSED PERIODS: My mom's were always rolled like an enchilada, I never saw them folded until the Suzette variation. I'd bet your Grandma made cherry blintzes. NATURAL ONE: They are for sure. LIZZY: Oh yeah, wait till you try this, it will be up front in your recipe-box. MISHA: Hi, that's interesting you love the fruit only. BTW, we bought a bag of oranges in NE Georgia (USA) because they were on sale and brought them to Florida (Coals to Newcastle). Thing is these delicious navel seedless oranges came from South Africa. The supermarket must have gottem free shipping. ALEXIS: If you miss your mom's crepes then try this. Make sure your spouse is standing by with a fire extinguisher the first time, hope it won't be the last. cm.